In episode 122 of the podcast astrologer Kelly Surtees and Austin Coppock return to the show to talk about the astrological forecast for September of 2017. 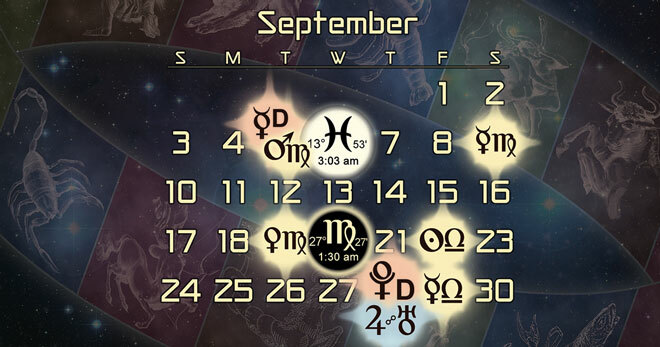 The astrology of September features the final of three Jupiter-Uranus oppositions, Mercury stationing direct in Leo around the time of a Pisces full moon, and at one point a stellium of five planets in Virgo. Later in the episode we also feature one auspicious electional chart, which is especially good for projects related to groups and friends, with Cancer rising and the Moon exalted in Taurus in the 11th house. We open the episode with some brief reflections on the solar eclipse in Leo and our experience of that now that it is over, followed by some discussion about the flat earth conspiracy theory that was discussed in episode 121, and some of the issues that raised in terms of education and certification within the astrological community. If you want to jump forward to the forecast segment of the episode, we start that discussion at 33:43 in the audio recording. There are three more electional charts that we found for September, which we will be talking about in our private subscriber-only podcast on auspicious elections that will be released tomorrow. If there is anything I dislike in Astrology, it is astrologers talking about politics or historical events of which they generally have very inadequate knowledge, if any….. I love this podcast, but I agree with you Peter. I think the political side could perhaps be made into their own episodes because it’s obvious which way the panel leans politically, which is fine, but I don’t think it merits some of the conclusions they come to (or seem to hope for). There’s a really successful nightclub in Brooklyn called House of Yes whose current incarnation as a successful nightclub opened around the time Kae Burke, one of the founders, had her Saturn return go exact at 5 Sadge. The previous incarnations of House of Yes were underground DIY venues, one of which burned down, and now it’s highly successful and mainstream. About eclipse events. At 57.31 of the Bernadette Brady interview referred to, she clearly explains her justification of why she sees the eclipse season (2weeks before and 2 weeks after) being the time of the event that would take place unmistakably – with changes and consequences that could run for years in the future. This is based on years of experience of chart interpretation. She explained that going farther out – say 6 months as many do, can get confusing since other predictive systems overlap the orb. Before I heard this interview, and event happened on August 2 that was so traumatic and final that it was like a sudden death. Since this involved real estate I owned with a former spouse, and the eclipse was to be within 1 degree square tof Moon and Saturn in my 4th house, I assumed it was the effect of the eclipse coming early. Note – August 2 was not in the eclipse season as the Sun was more than 10 degrees from the nodal axis on that day. What WAS happening on that day around 5PM PST was a Uranus Station Retrograde trine the eclipse degree from my 8th to 12th H, (the house of joint property from marriage to the house of the hidden and spiritual illness e.g.grief), both in fire signs. Within 2 quick texts I learned hidden information that was quite painful to absorb pertaining to my relationship with ex, as well as the news that our joint property burned down. Shock and Grief. Other events occurred adding to the shock, grief and finality. I thought I was done with the eclipse, went through the next few weeks reeling. Come eclipse day I was on my way to view it in the total path, only to be interrupted on the way out the door by a phone call that related to this August 2 event that was quite distressing. 2 hours later – a half hour after the eclipse I received a phone call from ex spouse that put my life on its ear, and I am still spinning. This phone call was every bit as bad as the related event on the 2nd. So, was the event that seeded the disturbance on eclipse day not part of the eclipse because it was out of orb? They are inseparable. My natal moon is on a critical degree of natal chart of the saros cycle of this eclipse. The eclipse point on August 21 was square natal IC, Moon and Saturn in the 4th H within 1-2 degrees, and using a wider orb of 4 degrees was the antiscia point between natal Pluto and ASC degree. I am holding my breath that Sept 5 and 6th do not bring further misery. Six months from this event will be late February 2018. There is a significant chance that an event at that time will bring this eclipse drama to an end. My Point is that yes, transits can be confused with the eclipse event since other things were going on in the charts of all involved that were clear indications of the initial August 2 event, including my daughter’s Moon being within a 2 degree orb, with ruler Sun (father) in her 4th H of childhood home. The house that burned was this home, her father and she were both in it and escaped. Transiting Saturn on father’s 4th H Jupiter opposing ASC ruler Mercury etc. None of ours lives will ever be the same again. How does one really pull the threads apart? Orb Schmorb. Brought the A-games today. Keep it up. I do have some constructive criticism to contribute. I just don’t want to come off too heavy-handed and irritable after last month. Y’all really need to get a modern psychological astrologer on here. Too much echo chamber. Can’t believe y’all aren’t discussing Chiron in Pisces quincunxing late degree Leo. I would go into more detail, but I would be foolish to throw all my hard work away. We’ll be peers soon enough. Gotta keep grinding. Let’s all keep up the great work. The traditional timing technique for eclipses goes back to Ptolemy (possibly earlier) & was used for a long time after. Assuming it was used for at least 1000yrs there must be something to it. Dr. Dykes explains Ptolemies account of this technique in great detail in his Astrology of The World: Vol 1. It’s broken into 3 parts: The start of the effects, the peak of the effects and the diminishing of the effects. This is taken into consideration in regards to the total duration of effects. The technique does make a provision for eclipses in which their effects begin immediately. Using Ptolemy’s techniques I came to the same dates for peak of the effects of this eclipse as a traditional Joytish (Vedic) astrologer, being mid-May 2018. Austin’s last comment makes a lot of sense to me because I’ve been trying to pierce through the confusing veil, but there doesn’t seem to be anything beyond the piercing of the initial veil. My main focus has been trying to make it through this first third of the semester at school, the first day of the semester being on the day of the solar eclipse. I’m still somewhat in that haze, but not as badly.